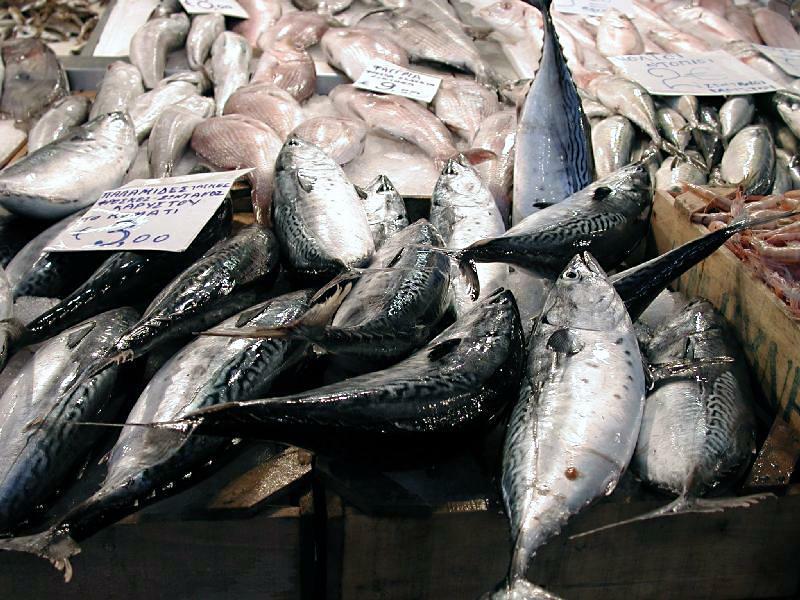 Fresh fish in Greece - bareboats, flotilla sailing and yacht charters. We have often enjoyed fresh fish on our many bareboat sailing trips in Greece, sometimes from a local market but more often directly from a fisherman. Just point at the fish you desire and he (we haven't seen a fisherwoman yet) will clean it while you wait. Note, that fish is not cheap at all, and lobsters are even more expensive. Yet, the fish population is not diminished by dolphins, whales or other marine mammals who usually get the blame, but by over fishing, not completely abandoned but highly illegal and questionable fishing techniques involving toxics or dynamite, and of course the ubiquitous pollution causes human beings. On sailing trips you will often see tuna hunting, pushing balls of smaller fish against the sea surface. These feeding frenchies subsequently attract dolphins, transferring the tuna from predator into prey.